Mack Brown fired Manny Diaz to try to fix the defense. So… now what? This is the second time in less than a year that you will not see the normal WTH article this week. The loss to Ole Miss 44 – 23 is another step in the decline of the program. The first time I did not write a weekly WTH article was after the shellacking by OU last year. I need to explain why I am not writing my usual article, and I also want to tackle the coaching situation at UT. The reason that I did not give a moment by moment account is because I left the game after the third quarter when Ole Miss took a punt to the house to make the score 37 – 23. I did not know what was going to happen next, but I assumed that the team had given up any hope of winning and so did I. You have every right to rip me for not staying until the end of the game to sing the “Eyes of Texas” win or lose. To let you know my track record, I have never left a game (season ticket holder) win or lose except for one other time. I left at halftime of the 66 – 3 rout by UCLA. The 1997 season was John Mackovic’s last year when the team went 4-7. I have the same feelings now as I did 16 years ago about this team and their head coach. I will continue to support the team by attending and cheering the Longhorns at the very next game. At that moment when Ole Miss went up two scores, I felt the only real message I could send to the administration, coaches and the media is to leave the game and have them see the empty seat. I hope the message that was interpreted from the empty seats was this is not the type of effort or standard to be played at DKR. I can deal with losing to a better team or the team having an off day. This team has lost its edge and confidence in the present coaching staff. The fan base has a sense of apathy towards this team and its coaching staff which is deadly for a program. I welcome your thoughts if I totally missed the mark on my exit. In regards to the coaching situation at Texas, Coach Mack Brown has eliminated any chance of getting another good assistant coach to ever come here because of what he did by firing (excuse me… reassigning) Manny Diaz. I am not going to argue the point if he should have gone or not, but no self-respecting coach is going to be on a program that has no stability and is not a cohesive group. I have to imagine that the other coaches are getting their resume together because they know that Mack is not long for this job. 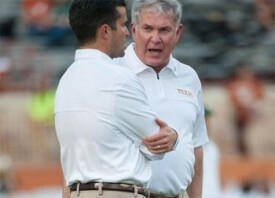 I will be totally shocked if Mack Brown does not step down after this season. My biggest concern is that the Regents, President Powell, and the new Athletic Director try keep all the assistants together by hiring Major Applewhite to coach this team. We all understand that change is evident, but do not try to lessen the change in order to keep the status quo. I hope they clean house and return an edge to the program that is lacking. Oh yeah, the edge should come from the Head Coach not the assistants or the star players. WTH Commentary – End of the Line http://t.co/X08ZGuNlj2 – Here are my thoughts on the team. Not good.